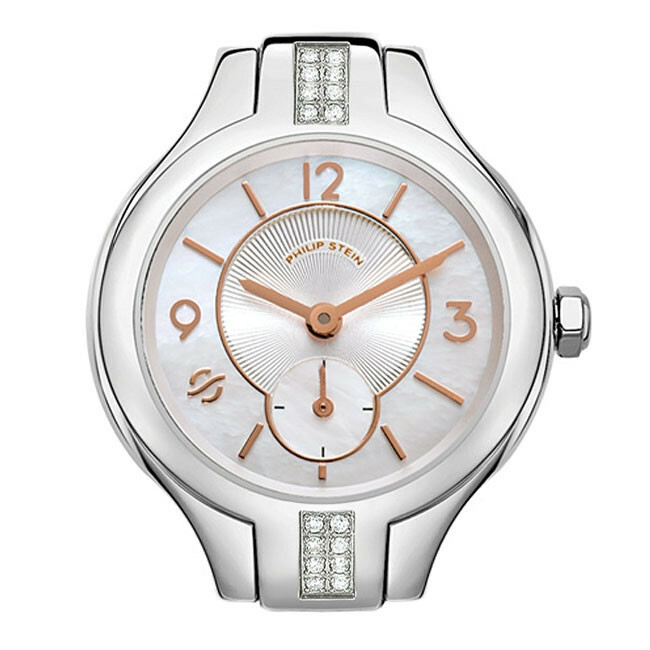 The chic style of Philip Stein watches is alive and well in this timepiece from the Classic collection. Smooth stainless steel surrounds the lush Mother-of-Pearl dial with rose gold-plated accents, and two patches of white diamonds glitter from the band ends. Infused with Natural Frequency Technology, this watch also creates a harmonious balance between you and the environment around you. This size 4 watch is compatible with 12mm interchangeable watch straps which let you dictate your fabulous style. As an essential wardrobe element, this Philip Stein watch will bring you a sense of well being, both physically and fashionably! Watch straps are sold separately, and JR Dunn has a 10-day satisfaction guarantee for all Philip Stein products.